Took my boy up to Disney Florida this Labor Day weekend. I must say, I am not a Disney guy per se, it can be a little intense for me. Overstimulation and lots of kids. Now, I recognize that kind of makes me a hypocrite because I too have a little one who I happily push around in an oversized stroller. I am a “cool” dad though, so when I push through the crowds obnoxiously I do it with an ironic bend. Imagine- faded gray Mickey Mouse shirt, that only hints at a devotion to the mouse that started it all. Truthfully, I really enjoy Disney, the cleanliness, politeness of the crew members, and the fun of watching my son’s excitement. Anyway, we ended up staying at an off site Hilton, which was great until we waited for half an hour with the little one looking perplexed as they tried to find our keys. I went to the Concierge and found out that they and the valet are all third party vendors. Despite the easy accommodations, this was a real pain. Staying on site is the way to go, Grand Floridian or Wilderness Lodge are my favorites. Good mix of quiet relaxation and easy access to the parks. Anyway, as we were close we focused this trip on Downtown Disney, which is being renovated to become “Disney Springs.” The changes look great so far, making it a little less chaotic and pedestrian-friendly. Changes look to be done according to a crew member in June 2016. See Disney Blog article. 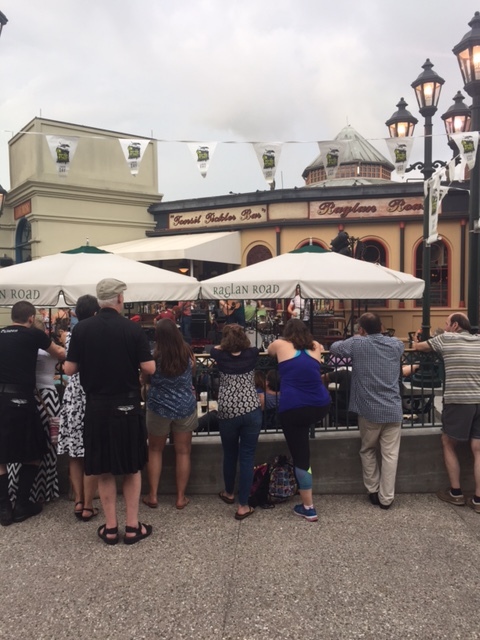 The picture below is our view of the outside of Raglan Road. The kid like me, is part Irish (also interestingly Norwegian and Native American) so he was bouncing one foot happily to the tunes. Note the kilts. The band members and dancers were very cute. Check out the funny website for Raglan Road here, the Irish animated voice is quite funny. We also managed about 10 miles walking, so great exercise without even realizing it. Let me know if you’ve been there, and had a few pints o’ Guinness! Previous Exciting News: Weekly Featured Blog on Blogelina!